Does 'budget' need to be synonymous with 'compromise'? In this case, unfortunately, yes. These days, buying a budget laptop doesn't always mean compromising everything you need from a computer. For this notebook, unfortunately, compromise rears its ugly head. Acer's Aspire E1-472G-6844, priced at $599.99 (about £350, AU$640), scrimps in a few important areas, making it hard to recommend wholeheartedly. 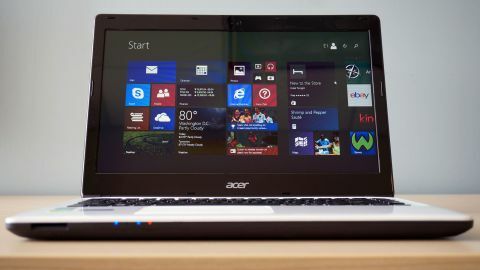 Still, Acer has proved with past Aspire notebooks, not to mention its impressive Chromebooks, that budget can be beautiful when it comes to laptops. And the Acer Aspire E1 does have plenty going for it in addition to its flaws. The E1 bears comparing to some of its contemporaries, but it's more expensive than the Toshiba Satellite S50D and lacks the draw of the Lenovo IdeaPad Flex 14's rotating hinge. So, the question is: can a friendly price, solid performance and adequate features make up for a couple of glaring flaws that can make even simple tasks – like browsing the internet or reading a document – feel like a chore? If you've used a decent laptop within the last decade or so, then you're already used to navigating, scrolling and clicking using a touchpad. With high-quality hardware, a touchpad can be an intuitive way to interface with your PC. Unfortunately, the Acer Aspire E1's Alps-made touchpad – including its accompanying mouse button – is simply not high quality. It's necessary to mention this now, because it just might be a deal breaker, no matter what else the E1 has to offer. The trackpad is responsive enough when it comes to the most simple task: moving the cursor around. But when it comes to doing anything else, the surface falls well short, despite its pleasant texture. Using two fingers to scroll is terribly finicky, with the pad either not recognizing what you're trying to do or actually somehow registering a lengthy scroll in the wrong direction. It's bad enough that you may find yourself simply using the arrow keys to scroll, like it's 1999, or even manually grabbing the scroll bar with the mouse pointer – like some kind of barbarian. Even worse, depending on what you're used to, the Aspire E1's mouse button is downright archaic. The single bar along the trackpad is actually divided into two buttons (though you can't tell from looking at it), and astonishingly there's about an inch in the middle that doesn't click at all. A right-handed person will find it nearly impossible to navigate with their right index finger and click the left side of the button with their thumb. My solution was to switch the functions of the button's two sides, so that left clicking was mapped to the right, where my thumb naturally rests when I'm using the trackpad. It's a clumsy and halfhearted solution. The laptop itself is comprised of a pleasant-feeling plastic with an attractive speckled pattern. It gives no illusion of being a high-end machine, but you won't be embarrassed to use it in public either. At 13.6 x 9.6 x 1 inches (W x D x H; 345 x 243 x 25 mm) and 4.63 pounds (2.1 kg), the Aspire E1 is rather hefty and, realistically, far too heavy for what it is. But as terrible as its touchpad and button are, the E1 keyboard is just plain great. Its responsive keys jump to do your fingers' commands. It lacks a number pad, and it would be nice if the keyboard lit up how am I to know if caps lock is on?) , but it does fit navigation buttons (home, end, page down and page up) and the brightness and volume controls are conveniently perched on the arrow keys. There are some other flaws in the Aspire E1's design – like the placement of its wimpy speakers – that add up to a performance that's less than what it should be for $600. But there's plenty of room for that on the next page.